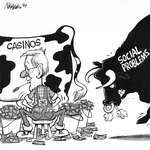 Steve Nease Editorial Cartoons: Casinos or Social Problems? 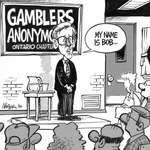 Steve Nease Editorial Cartoons: Remember Floyd, Be Gentle! Steve Nease - Editorial Cartoons: "The Zit"
Steve Nease Editorial Cartoons: Applesauce? Steve Nease Editorial Cartoons: Is there a doctor in the house?